Li Jingchao is lucky to be alive after a chopstick pierced into his nose and touched his brain. Beijing, China (CNN) -- Li Jingchao learned the hard way -- be careful what you stick up your nose. 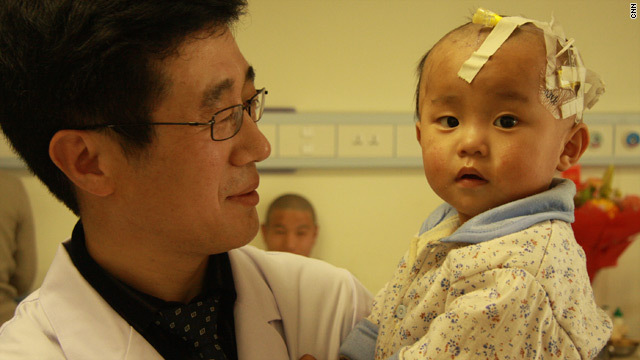 The 14-month-old boy was playing with chopsticks when, his doctor says, he fell and one of the sticks pierced his nose. "It touched upon the deep area of his brain, four centimeters of the chopstick was inside his skull," Dr. Sun Wei told CNN. Jingchao's mother, Zhao Guilu didn't see what happened -- she was in another room at the time, but came running when she heard her son crying. "I was washing dishes. I rushed in and saw him lying on the ground. He couldn't stop crying and I noticed a chopstick stuck in his nose." She went to a local clinic, but doctors there warned her it was too dangerous to try to remove the chopstick because it may cause massive bleeding. Zhao was frantic and called her husband. A relative offered to drive them from their small village, hundreds of miles to a hospital in Beijing. "I thought at that time, it is all over, my boy will die," said his father Li Guanglai. "During the 10 hours of driving I felt depressed. I could barely breathe. I looked at my boy and his right side was numb. He was paralyzed." Neurosurgeons, including Sun prepped for surgery but they feared removing the chopstick would rupture an artery. The little boy's head was shaved and they were ready to open his skull to control the bleeding if necessary. But when they pulled the chopstick out -- nothing. It simply came straight out, much easier it seems than how it went in. "I never thought it would be this successful." said his dad. "I would say this hospital gave him a second life." Doctors said if the chopstick had gone any further in it would have caused life threatening bleeding and if it was a little more to either side the boy may have been permanently paralyzed. "The position of the chopstick was very, very lucky for him," Sun said.